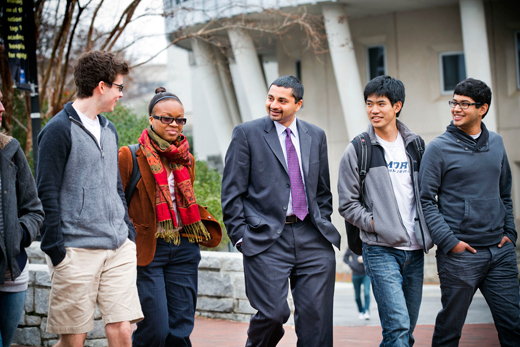 Senior vice president and dean of Campus Life Ajay Nair (center). Emory Photo/Video. Ajay Nair studies the whiteboard in his Campus Life office, eyes lingering upon the priorities he's scrawled there —a list that represents a critical touchstone for the coming academic year. The words challenge him, motivate him and remind him what matters — part of a deliberate strategy for what Nair believes will help make Emory "a distinctive learning community." If last year — his first year here — was a time of listening for Emory's senior vice president and dean of Campus Life, consider the coming academic year a time for action. For after a year of talking to campus stakeholders, Nair has a developed a renewed vision for Campus Life, a plan for building a stronger, more unified community that relies heavily on relationships, education and engagement. New appointments within the division's leadership structure (see sidebar). A new campus-wide policy on dissent and protest, including the proposed creation of a Committee on Open Expression. Food trucks on campus for late-night dining, and more local food producers/vendors in Cox Hall. Increased faculty involvement and academic engagement in residence life. A long-range strategic plan for Greek Life. Emory parents as educational partners. Advancement of the Emory Bubble as a campus communication platform. Employing the Barkley Forum/Dooley Debates to address controversial topics within the community. Installation of the Black Student Union in the Dobbs University Center (DUC). A revised Campus Life mission, vision statement and credo. The initiatives are among some 15 new priorities for Nair, who believes the time to advance them couldn't be better. And he's anxious to welcome the wider Emory community as participants. Framing the plan is a desire to seize educational opportunities in everyday places, whether that arises from serving international students to campus-wide cultural dialogues to reimagining what residential education at Emory — perhaps even creating "a living lab within residence life," says Nair, adding that specific recommendations from an Academic Engagement Committee are due out in a few weeks. "Emory is a liberal arts research residential community," Nair explains. "How do we embody that?" "As a university, I feel like we're coming of age in come interesting ways," he says. "We talk about being a ‘destination university' — I say we're a destination for dreamers. That means you aren't coming into a static community, you are always going to be changing, always ‘becoming.' And I think that's an exciting prospect, an opportunity not only to dream, but to dream big." In the past year, Nair has come to understand how relationships "are the foundation of Emory and drive our ability to affect change" — a strength he counts among the University's many "uncommon characteristics." Nowhere was that more evident that the Campus Life Compact for Building an Inclusive Community at Emory, a student-driven report released this past spring to help advance campus dialogue around issues of social justice. Initiatives that arose from that report — created with input from campus forums, conversations and peer-to-peer activism — are either already underway or will be in the coming year, according to Nair, who credits the rapid momentum to Emory students who were willing to act as "change agents." "More than anything else, I think we need to create a culture at Emory where we can speak openly and freely about our lives and experiences," he adds, "to help us get to a better place, better decisions — just a better community." As new freshman arrive on campus this fall, Nair has one wish for them: "That every student can feel not just a sense of belonging, but the invitation to actually put their footprint on the campus community and the world around them." But this year's priorities are only a starting point: "There are a hundred other things we'd like to do, but these are things we can accomplish this year, and they will be transformative for the University community." "Some of these goals are low-hanging fruit for us, others are more complicated, more complex and will require community energy to make it happen. But we're going to do it all and it's going to be huge for Emory. I'm excited to help lead it."